Walking through the archway to the offices at the back of the Castle, the Bangles song “Just another Manic Monday” often sounds in my head. Somehow Mondays always start with too many meetings, often at the same time as each other, all urgent and with small knots of bright eyed and rested staff wanting a quick word before starting the new week. The peace of a Sunday evening rapidly fades to a memory and, what’s more, sadly, there is no longer even Downton Abbey on the Sunday night to get one going. Before I begin Mondays, I need and love to be outside for a while. To see the sheep en route to new pastures, meet with the gardeners and laugh as the puppies chase each round in circles. Then it is into the lion’s den so to speak. Last week, there was even a queue in the office on the previous Friday evening to see who I would meet first on Monday morning. John G, the Castle Manager, refused to go home until I agreed to see him before I saw decorator Pat and carpenter Josh who, in turn, were before Maggie the groom – but she was mucking out and lost her place – with Louise, Emily and Mimi all declaring they too needed a moment. It quickly became clear that other office meetings would have to happen on Tuesday morning instead. My office is consistently in a state of meaning to be cleared up. I always have the best intentions but somehow life takes over. Thus each Monday I begin by again apologising for the chaos as we all perch round on a selection of wheely stools, assorted chairs and exercise balls to plan for the week. 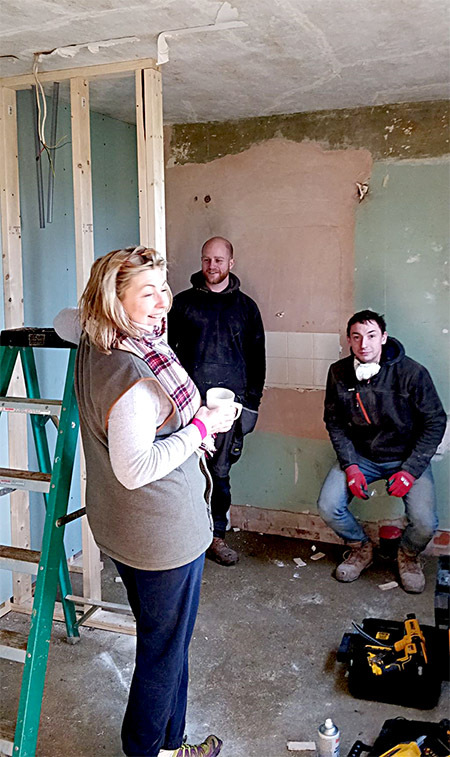 Pat from the decorating team sits on a chair, Josh from the building team and Mimi and James from the estate admin team have stools whilst Trevor the brickie and David the electrician, depending on who’s needed, prefer to stand. However, we do all need coffee and sometimes we treat ourselves to a croissant but only if my husband isn’t looking! Whilst we have the two holiday cottages for visitors to the Castle for a week or weekend, we also have a few longer term lets as well. Just now, I am in the midst of reconfiguring a gem of a house which will be transformed into a home with space, a lovely view and the potential to become a real haven. There are various decisions to be made so I drive down to see it with James. Standing in the new bathroom, I ask James to pretend he is in the bath. I think Ben is where the loo should be whilst Josh is in the shower. It is a practical way of seeing the space and then they can all pretend to wash their hands. Everyone is quite used to it now and someone volunteers to pretend to be in bed and someone else to see if they can walk round the imaginary bed. We all imagine we would like a cup of tea in the morning – how far away is that? The answer was too far and we needed to find a better solution. Where is someone going to sit outside? Where is the sun? Where can they park their cars and where can they stack logs for a fire in a snug? To my husband’s immense astonishment there is rather a detailed budget (thank you James) and invoices marked off against quotes. 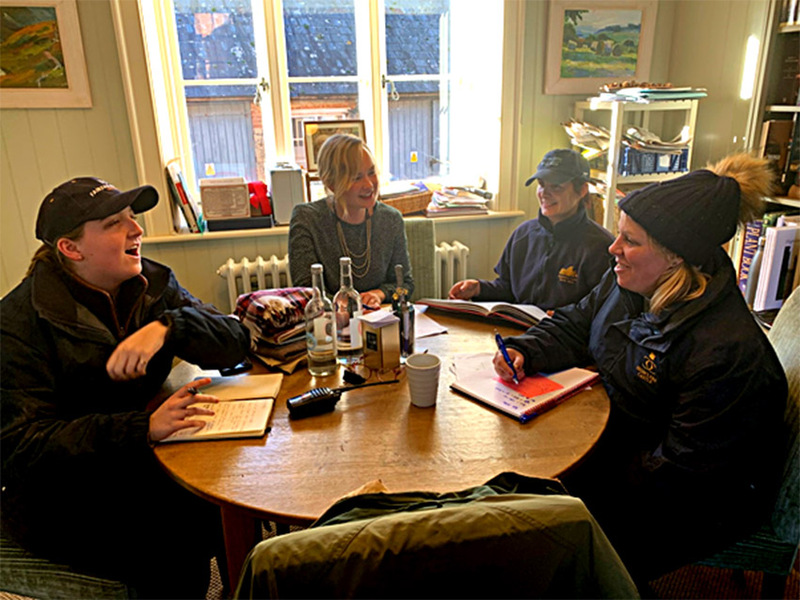 Abbie’s meeting was about coaches and groups, Emily’s about car parking, Maggie and Sam about horses, foals and holiday cottages. Mimi was all about lists whilst James had concerns about planning. Louise, Sally Pop, Justine and Hannah were anxious about my book deadlines – oh my goodness, they are looming so I am now writing until the small hours of the night. 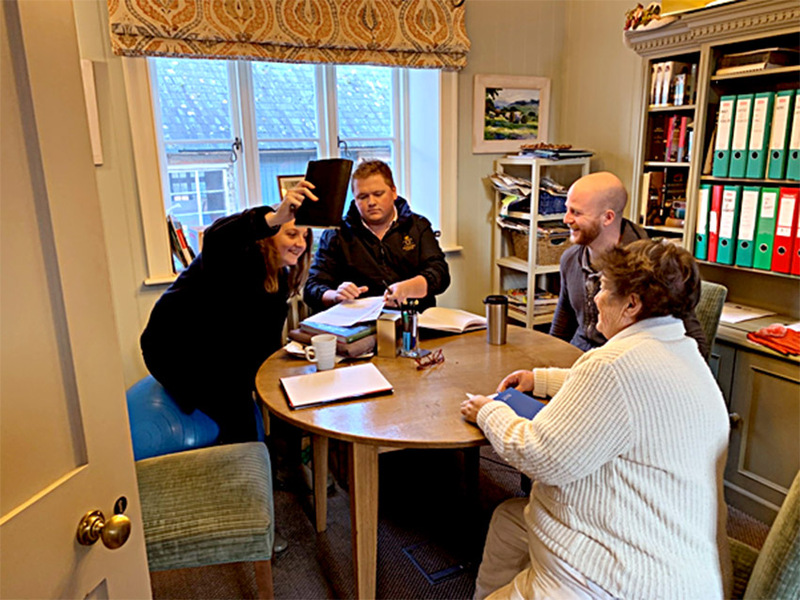 John wants to see me about the Downton Abbey Concert, Charlotte is checking off the Viking Cruise special tours we have offered their guests for 2020 and Stephanie has some wedding enquiries. Coffee needed again, it is already lunchtime and I need to regain some head space to write. It really is just another manic Monday! Gosh it’s so nice to know other people’s Monday’s are a hectic as mine. Remodeling a bathroom so this was very timely. Snow and ice on the ground but it is time to plan and order seeds for gardening. However is nothing like a cold brisk walk and a hot cup of tea to start the day! Love your blog! It does seem cold today, but nothing like that! Downton Abbey is on here on Sunday nights! Who would have dreamed you had been so busy all morning? We were part of the afternoon tour on Monday, January 21, 2019. We listened to your gracious welcome and toured your wonderful “home”. We were avid fans of Downtown Abbey and were to excited to finally reserve a tour. My brother-n-law was delighted when you actually took time to personally show him around the Egyptian Exhibition. We all left with wonderful memories! I look forward to reading your blog! Come visit us in Texas! Thank you! Life flashes by so quickly… I am ferrying a couple of young ladies to brunch after a sleepover – they were just wee ones a few blinks of the eye ago, and are now on the cusp of becoming teenagers! I have my own perpetual to-do list and I sympathize with how quickly the days fly by, and I, also, try to take at least a few breaks from my roller-coaster busy days to take a couple of deep breaths and look around me with appreciation for all I have. I hope your busy crews accomplish their goals this week, and you get an opportunity to get the writing time that you wanted. The pictures on your post are so lovely. I would smile every day to walk through that arch, and see the sheep off to their grazing. Cheers from Summerville, SC! All the best to you, your family, and staff. The sheep were so funny ..
We really enjoy your blogs. You make us feel that Highclere is our second home. Love reading your blogs. I feel the same way about Mondays. Life must go on. Always improving and changing. However we would have it no other way. We would be very bored. Happy Monday today!!!! I so love the view through the archway! It’s the type of behind the scenes photo that makes your blog so special. Thank you for sharing a piece of your life and home. It encourages me to share more freely on my own blog. All blessings to you and yours! Lady Carnarvon, I understand why you need that special time outdoors before Manic Monday begins. I think I need a nap after reading how your day unfolds. PS Love Josh the shower model and Ben the loo model. That made my day! Ben and Josh and Adam are doing so well..
Wow how do you get it all done? I didn’t know you were writing a book; how exciting! I’ll be anxious to read it. And Downton Abbey Concert? Where will that be held? You know, one day during my yoga class in the midst of my deep breathing & stretching, I heard some Downton Abbey music…..I loved it, yet I felt a bit nostalgic & wanted to hear more!! Yes it does sound like another manic Monday but I have confidence it will all get done. Anxious to hear reports of the new construction. Have a great week. The concert is just the other side of the haha – the castle in the background and on screens so rather surreal!! I love the blogs. I return in my mind and emotions to your beautiful home and again find that peaceful quiet so desperately needed here in America. I am saving to bring my daughters to see High Clere as soon as possible. Thank you again for sharing your wonderful home and all the moments that make it magical. It is magical and bit manical!! It’s so lovely to read we are not alone—-even castle owners have “manic Monday’s!” Hang in there Countess! We have a morning news show that travels around to local places and they haved enter a contest to sing “manic Monday” on TV. It’s quite the hoot! I am amazed at how hard you all work to keep up Highclere Castle, and create more opportunities for the world to enjoy it as much as you do. It is a gem, and you and your husband are the perfect caretakers. Happy Monday! Hello from Ohio! I am new to your blog. I am also a new Downton Abbey fan having binged all seasons in 2 weeks. I am totally transported for a virtual escape through your blog. Thank you so much for being open and willing to share your life and home! Thank you – I am glad you enjoy it. My Lady, I admire you very much and I enjoy reading your blogs. They always bring my heart back to rest in England if only for a short time, Thank you and have a lovely day. Your post is such a lovely example of life lived well with such love. Thank you for the peek into the hands-on management and the kudos to your staff. Glad to know you can appreciate the outdoors and restore your soul-energy with the beauty around you. Well-done. I feel the cheery energy through your words. Emily your famous!it looks wonderful there. And sounds very busy! What a relatable story; now the lyrics are singing in my mind as well! The renovation space of the house looks like it’s going to be amazing – I can visualize the finished project – what fun! I’m helping advise a friend on her renovation at the moment (walking the space with newly poored concrete & stone pavers selecting paint color & looking at fabric swatches) she of course is overwhelmed at this point and is ready to see the rainbow at the end of the storm! It would be amazing if you could share the progress as your new project progresses (before & after photos would be exciting to see)! All of your new projects are such a great way to kick off 2019 – “Happy New Year”! Can’t wait until our visit in June! 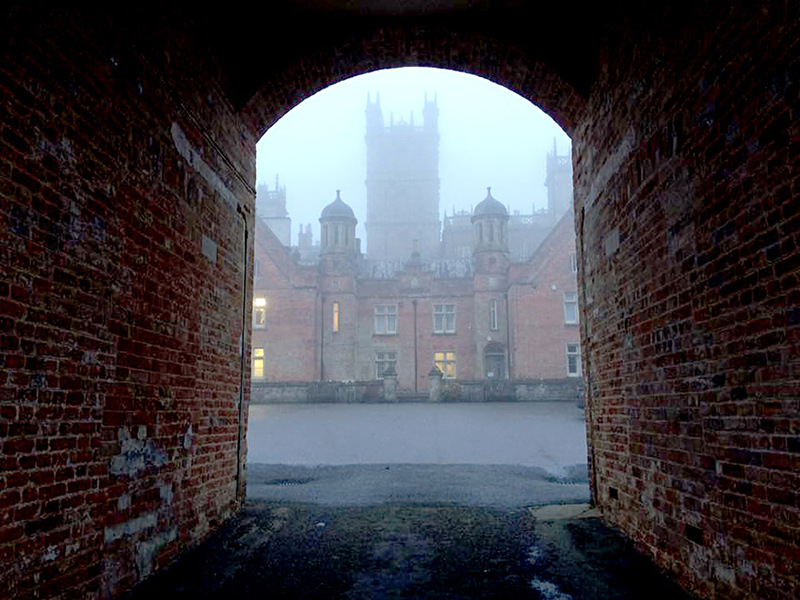 Thank you for your enchanting stories each Monday – which I immediately forward to my “Downton loving friends”….. Most people see Monday as the start of the work week. For me, it is the end of my week. I spend several hours each Monday morning composing emails and leaving voicemails to tidy up the loose ends from the weekend. I have a sense of accomplishment when the last of the paperwork is tucked into the appropriate cubbyhole. I then sit back and watch the rest of the working world come to life clutching that all important cup of coffee. The truth is the world continues for ward no matter what the day. We spend our time catching up to the elusive finish line. Each day it moves just out of reach. We resign ourselves to the idea we are never done, and stop to enjoy the view. How very true, thank you. So hard to believe there is so much going on behind the scenes when you visit as it is so quiet and serene. Must say the way you split the groups and take them each a different way is great. When I was there two years ago there was a lady in my group that had a large backpack on. I held my breath every time she turned around as I thought she was going to break something. Thankfully we made it thru with no spills. Also very impressed that we got to hear you before the tours—makes it much more special. Looking forward to seeing you in May. Thank you. We look forward to welcoming you back to Highclere. So love reading your blogs. Hope to visit from the states one day! Have a wonderful week! Thank you – you must come! Its so nice to hear of other folks manic Mondays! Mine is somewhat less hectic having retired a year ago, but somehow I still have a lot to fit in! I love your blogs and humour. Quite makes my day! I am planning on bringing a friend to Highclere this year sometime. She is an avid fan of Downton and I can’t quite believe she has never been! Please do bring her along – I am sure she’ll enjoy her visit. As a retired person my week consists of 6 Saturdays and 1 Sunday. I don’t have the obligations that you have. Do you see yourself being able to retire from the daily/weekly planning that you write about? Not yet – my father-in -law was busy with committee meetings in the House of Lords, doings things here until he died. I am trying to reach a point where I can review and look a little further, but i am not yet up that hill. Greetings from Fort Worth, Texas. One particular Manic Morning I had was when my children were in school and I was scheduled to attend a meeting with several state medical board executives. They had misplaced their school papers, my daughter was in tears because she felt she didn’t have anything to wear, the dog dug under the fence and was happily trotting down the street, the morning was hot and humid so my hair was a frizzy mess, but we finally found the dog and fixed the fence. We all piled into the car. It needed gas. Dropped the kids at school, stopped to fill the car with gas, and broke speed records to get to the office. Actually arrived on time. When it was lunchtime, a lovely South Carolina physician sat next to me, leaned over to whisper in my ear, and said, “Dahlin, what happened to your lovely hair? You look like a dandelion. And, hon, your shoes don’t match. Bad morning?” I was mortified. Now that the children are adults with their own families, I remind them that bad mornings don’t last, and that they will miss them dreadfully. Enjoy every tiny moment. How funny and how real ! I do so enjoy your blog, as it makes me not feel quite so far away in Montana! It seems as though you are constantly upgrading and improving the estate which is wonderful! I hope someday to be able to visit! Until then, I do so vicariously through the blog, articles, and watching the Downton Abbey series! Thank you for all your efforts to preserve this beautiful estate! Beautiful archway scene to kick off a manic Monday! And the sheep are so tranquil, it must help to stroll outdoors before heading to the Monday meetings. You have a lot of work, dear Countess, and you surely inspire your staff with your enthusiasm and you great humor! May all the chores be done and you should be given a gift set of the DVD Downton Abbey episodes to watch on a quiet Sunday evening. I have the full 6 seasons and so enjoy replaying when I want to be transported back to beautiful Highclere Castle, can’t wait for the movie in September! I am looking forward to the concert and the movie! I am counting the days until my first visit to HIghclere in May. Until then, I read every word of your blog and thank you so much for writing it. When are you coming in May? Your posts continue to be both delightful and insightful! Thank you for your gracious glimpse into life at the Castle! Thank you for sharing. It is always a delight to see what you are up to! It is my dream to visit from the US one day! Thank you for sharing your home with us in so many ways. Also, looking forward to the Downton movie. Thank you so much for taking the time to write your Blogs. Each and everyone of us enjoy them very much. It’s a great way to start off our morning. I miss seeing the Downton Abbey on Sunday Evening. But then I realized that our PBS was airing the reruns on Sunday Evening . So, now I am watching and enjoying them very much. Also, I started reading Lady Almina And The Real Downton Abbey Book. I look forward to reading other books about Highclere Castle. Sounds like you have a very exciting and hectic day ahead of you. Thank you for allowing us to be a part of it. Sounds like your Monday’s are very busy. However, I think of how interesting and inspirational this must be, despite the chaos. A lot of details to cover, but all moving in a creative direction. The new house project must be very exciting. Love the fact that you provide accommodations on the grounds. So much history and nature to enjoy during one’s stay. So great to know the castle is bustling with progressive energy, and that you are preserving and creating your own history every day! Good morning, actually I suppose it is nearly evening there. I have only recently found your blog, but I am a long time fan of the Carnarvon’s, having been obsessed with Tutankhamun my whole life. Of course I’m also a fan of Downton, and even more of old houses, castles, history and the like. 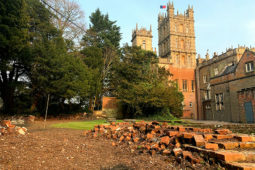 As much as I adore looking at the completed Highclere, the tidbits I’ve seen of the unrepaired portion are just as fascinating. What lives were led there? What did those hollow rooms see and hear in their heyday? What ghosts – if not literal but figurative – does Highclere hold in its ancient foundations, it’s moldering wallpaper or crumbling boards? What I wouldn’t give to spend a week just working there. Helping in your manic Monday devotion to hold up those amazing walls. Perhaps one day. I share your curiosity and have great fun discovering the stories this wonderful building has to offer us. The one precious day we spent at Highclere last summer was a dream come true. A trip of a lifetime for my husband and me. Our experience was full of beauty, tranquility, and awe. The hard work and “mania” behind the scenes was never visible to us, except as it was evident through the well maintained, manicured and organized house and grounds. From rural Missouri, we thank you for one lovely afternoon!! I am so glad you enjoyed your visit. The whole team here works very hard. people, except during the war years. activity and sometime for everyone to do. We have a wonderful team here, who all work very hard alongside us. Your responsibilities are as vast as the castle and all the surrounding area. You seem to handle them well as can be done, considering the constant movement and change. You are an inspiration to me. That’s very kind – I just multi-muddle my way through as best I can. Enjoying a “manic Monday” here in the States…but the fresh cup of tea in my Highclere Castle mug is making it a bit easier! Thank you for sharing these fun “behind the scenes” bits of life at Highclere! Thank you for yet another glimpse into your Highclere life and all that you and your staff are doing to preserve and share your lovely home. I can completely relate to your comments about your best intentions to get your office organized and then life takes over. Isn’t that just the way of things? And now, as that Bangles favorite is stuck on a looping track in my head, going to put on my 80’s playlist as I attempt to use this day off from the office to try and organize at home. Wishing you all the best. Office still no better, but puppies asleep behind me! I think all the English-speaking world will be singing that song all day today. Thankfully, this Monday is a holiday in the US (Dr. Martin Luther King, Jr. day) and as I work for a university (the same one the Duchess of Sussex attended), I get the day off. I have been sorting paper for 3.5 hours. Next, I’ll go finish painting the 130 year old storm windows I had dipped (so as to avoid exposing my family and myself to lead paint) and reglazed. So, even without paid work–I’m making my own manic Monday. So excited about the film.I live in South Australia and wonder how and when it will be available for us to enjoy here? Is it set to be a TV MOVIE or shown at cinemas or simply released on DVD? We often have to wait longer for things to arrive here for us…my impatience is showing! Are you able to suggest a date and avenue to see it or purchase a DVD or any other clues in accessing this long awaited and highly anticipated gem? Thank you for enriching our lives through your words and for breathing new life into Highclere so that so many are ablecto be thrilled by visiting. Love your blog! It is clear it is a labor of love for you and your team!! My sister and I are coming in September!! Our 2nd trip to the UK and first visit to your beautiful home!!! Have a wonderful week. Thank you for sharing stories of your busy busy day, at least you cant get bored?!. I like the planning where everything’s going to great detail. I am not jealous of your busy day but would love to be able to breath in the beautiful views every day. How do you manage to fit in writing as well? I struggle fitting in time to write my Mothers life story & I am retired, I just keep getting side tracked. Prevarication – I know it well..
You are quite a busy lady. I studied Interior design and can relate to your projects. It sounds that it is quite a challenge running an estate as yours. The place is so lovely. It is a Blessing that you have a team to help. Thank you for sharing daily life. After reading how busy is your Monday with meetings and projects, I feel exhausted and guilty. Guilty because I’m lying in bed watching TV doing nothing. Couldn’t go to work because I have tendonitis in one hand and I can’t put stress on the tendons. 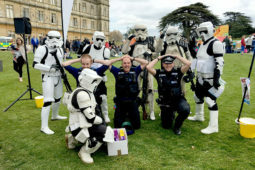 I bet it’ll fun to volunteer at Highclere. Your blog brought amusement to my boring day. Have a great week! Thank you – I hope the tendons re knit – very boring for you! Happy New Year! I have not written in a while because I was busy too and reading the blogs way after you wrote them… So all the “busy-ness” is so familiar but in another environment I work for Université de Montréal in the psychology Department, very different, but as busy! LOL! The last picture, is it in your garden near the greenhouse and lavender that I loved so much because it is like ours at home? I didn’t see this when I went and it is a beautiful monument, it reminds me a little of La Gloriette of Schönbrunn in Vienna at a smaller scale. What is it? So much to do so little time, but we like it, it keeps us alive in many ways! Lovely to hear from you Chantal! I have never responded, but loved reading a day in your life. I think its magnificent. I just close my eyes and just daydream… I am from country land Tennessee(USA) and we get the privilege to do a tour and it’s the Last tour of this season in February I am sooo excited for the little walk in your shoes. You have done it again! A very informative and entertaining blog. I look forward to your writing each week. Your blog reduces a manic Monday to a manageable day for me. I can entirely relate to the renovation issues. When I grew up in Ohio, my family perpetually renovated our house. And during our 52 years of marriage, we have redone 9 houses. I have plaster dust in my veins! My compassion is abundant for you. It has to be a great help to have such a devoted team. Thank you for the diversion and information. You never fail to bring a smile to my face after reading your blog. Thank you – I think this one is going ok which makes me rather nervous..
All I am doing is laundry and cleaning out the linen cabinet! 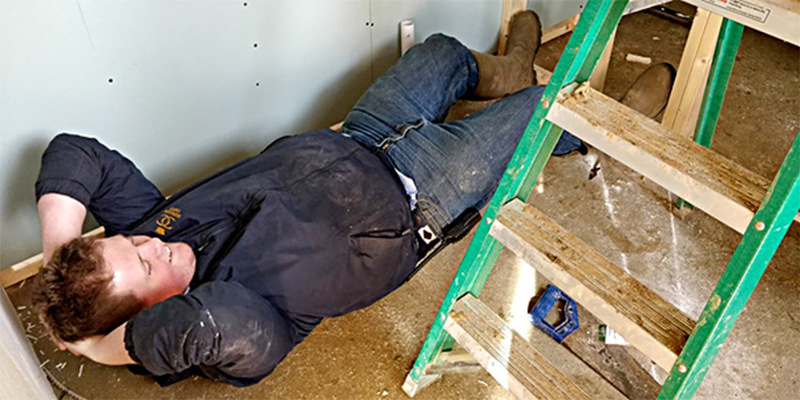 Sitting here reading your blog and laughing out loud- I love the loo position someone so gallantly volunteered – HA! thank you for making my day start out grand!!! I think we are quite down to earth..
Wow, you sure are a busy lady, but do you have to be? It appears to me that you are trying to do far to much yourself. Maybe an overall General Manager is the answer.? You could then just meet with that one person a few times a week to make the important decisions and leave it up to them to handle all the other less important day to day things. You could then pick and choose what projects you wanted to get involved with. We have an excellent general manager and I met with him first thing to make some plans. We have an excellent farm manager too … there is a structure to all aspects and I like to ask people to take responsibility once a project or the week sets off. It is more interesting for them. I did “mingle” with a tour today,which was nice and I walked the dogs! 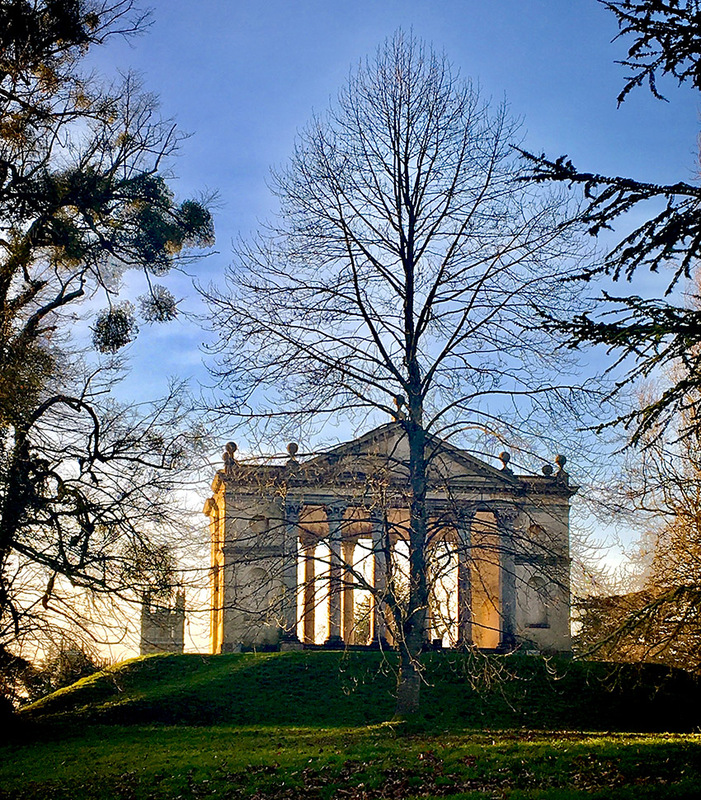 I work in a high pressure job and your posts – even the simple recounting of the minutiae of daily life on the estate – transport me to the beauty of Downton and Highclere for a few moments every week. 17000km away here in a little rural town outside of Sydney, the beauty of your estate feeds my soul. 🙂 We hope to visit in the next couple of years and like many here, eagerly await the film in September! 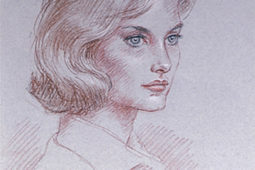 Thank you to you and your team for dedicating so much of your life and efforts preserving and enhancing Highclere: it is truly a gift for us to share in its timeless (through great effort) beauty as well. Much love from Down Under. Muddling through Mondays is never what you expect it to be! You are well-organized and yet stop a while to enjoy your world at Highclere. Your blog is superb! My goodness!! My heart rate increased just reading about your “Manic Mondays.” Well, along as one is living life there are sometimes “manic Mondays” as you described or “fire drills” or drop everything now and do this” …and the lists goes on. On the other hand, it makes for interesting and varied experiences and isn’t that what’s life is all about. Furthermore, your blog post makes one appreciate even more the effort behind the scenes to keep High Clere running smoothing and open for our enjoyment. Thank you for your hard work and thanks also to your staff. Kudos to the doggies for keeping you sane. I love your blogs! What I want to know is, do those beautiful sheep know how lucky they are to live in such a delightful place? You have a gift for making mundane meetings seem quite interesting! So wonderful to walk around the grounds before you get started with your day. Yes, I miss Downton Abbey too, but we sometimes run through the entire series on DVD, so that helps. Hello again Lady Carnarvon – In my comment above, I mentioned how excited I am to be visiting Highclere in May, and you asked me when in May I was going to be there. I just purchased a ticket for the Art and Architecture lecture on May 12! Hoping for good weather, to enjoy the gardens too, but I’ll take whatever mother nature delivers! Wonderful I am for sure there and giving the first talk and there on the tours..
Love reading your Blogs. They are so straightforward and very enlightening. Three years ago, I was lucky enough to bring three girlfriends from Milwaukee, WI, USA, to your home, for a private fall weekend experience with very small groups. Hopefully I can schedule a weekend like that again soon. In the mean time, this past weekend, while at the movies, they said the Downtown Abbey movie is coming to us in Los Angeles, September 2019. Could we all be this lucky and is it true? Have a fabulous spring. It is being released then! I wonder if it is possible for the working week at Highclere to be set to a soundtrack? You have already mentioned “Manic Monday”. Another Bangles’ hit seems very appropriate for Highclere – namely “Walk Like an Egyptian”, although it is a somewhat inappropriate title coming From a less culturally correct time. 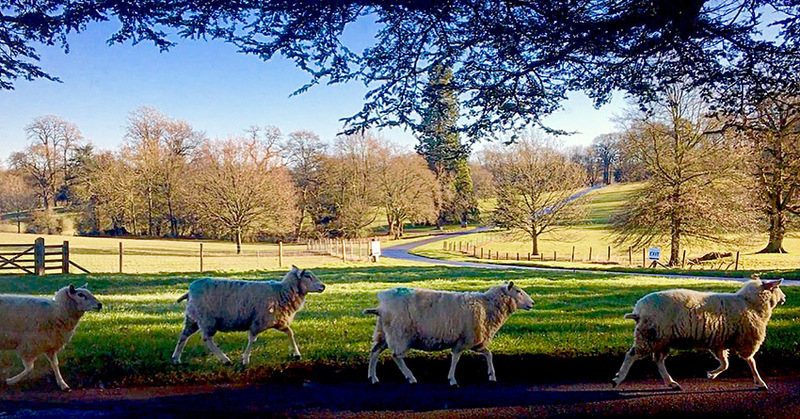 The four lambs (pictured in your Blog) also got into the act by mimicking the ‘fab four’ at the Abbey Road crossing. Also, given the respective positions of Josh and Ben (in the yet to be built shower and toilet), they need to heed another song from the ‘Abbey Road’ album – viz. “She Came in Through the Bathroom Window “. I will also take this hypothesis one step further and suggest that there is enough evidence to present a case that your blogs, as delightful as they may be, nevertheless contain cryptic or even subliminal messages. Has any consideration been given to publishing some extracts from these blogs? They always are informative, amusing and a sheer pleasure to read. . Undoubtedly, such a book would be a best seller. PS An early greeting to you and all fellow bloggers of “ Kung Hee Fatt Choi”. Thank you and I also have some unpublished blogs from various events which are the funniest, where I have really made a has and am crying with laughter.. The photo of the view through the archway is lovely. So simple, but it makes me feel as though I can see into the past. I always love seeing the candid shots, as well. Thanks for allowing us a peek behind the scenes! We just love reading your blog! Looking forward to a wonderful weekend at Highclere Castle for the Downton Abbey concert in June. I am delighted you are coming over for it! Just another manic monday, was one of my favorite songs when I was in school. Such a happy melody. It helps with all our responsibilities at once. Some of us have “manic Tuesdays”…. I admired your resilience and that of your whole staff, you work tirelessly to keep Highclere castle and grounds beautiful, for us to enjoy. Thank you. Please share the day for the Downton concert. Kuddos to you and your family for preserving one of the Estates that are a wonder of the 19th century. It is a huge undertaking of administration to keep it running so well. You are a very talented lady. And thank you for allowing visitors to share it with you. I am impressed by your idyllic life to be able to ride horses over that beautiful landscape. I have the horse bug as my great grandfather was a groomsman in nearby Marsh Benham in the late 1800’s which is now the Polo Club! I enjoy your blog and your photos transform me to another world…. Thank you – I think we all try! Beautiful blog. I cannot wait to soak up all the stories and scenery and beautiful pictures and stories! Will revert but am trying to finish a book and have a deadline of under a week..
Oh wow. What a feat! I hope it goes well and look forward to whatever you are publishing. Wishing you well. Thank you – well, I swing between excitement and panic!! !